Sorry to cut short ..im really low on funds..you were quick and in tuned..thank you for that! ...i will follow up with you soon! Tara is excellent every time! Right on with the situation! Ty so much. Welcome to my listing..I offer accurate, soulful and insightful psychic readings which integrate the ancient arts of tarot, astrology and other metaphysical studies. I have been a student of the Spiritual Arts for over fifteen years and have consulted regularly as a reader both privately and with a national psychic phone line. I have advanced degrees in the Environmental Sciences and use this training to help find our spiritual connection to the planet. I have traveled extensively throughout the world and bring a global and non-judgmental understanding of cultures and experiences to my readings. I am also available for chat sessions and email readings. Email readings (pay per view) are $6 for one question, $12 for two questions and $15 for three questions. 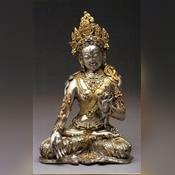 The beautiful goddess Tara, (pronounced tah' rah) whose name means 'Star' - originated in Indian Hinduism as the Mother Creator. Tara is called upon in times of need to provide protection, and to help steer a clear path through the chaos. Taras Garden has been a user of Keen since 2005. Getting Life Questions advice from Taras Garden through www.keen.com is safe, secure and confidential.